Want to save on your hot water expenses? Call your Annapolis tankless water heater repair and installation experts at (410) 268-7191. Click here to view our current specials and discounts. Tankless water heaters are gaining in popularity among homeowners for their long term reliability and hot water on demand features. If you need to install a new water heater, you will find that a tankless system features several advantages over the traditional water heater. 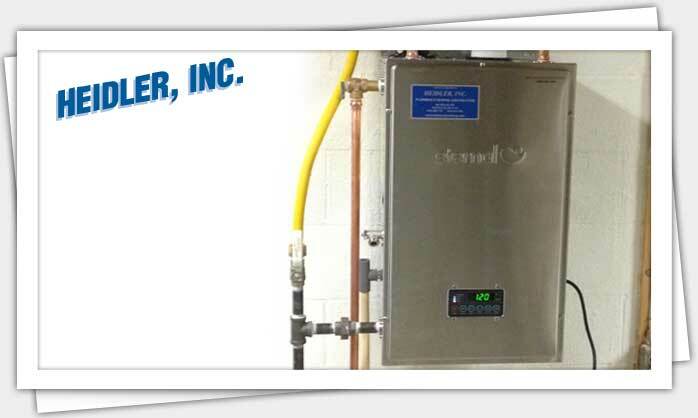 Reap the benefits of this technology by calling your Annapolis tankless water heater repair and installation team at Heidler, Inc.
Want to see how we have helped your neighbors? Click here to visit our reviews page. Unlimited hot water: Tankless systems heat water on demand. This means there is no finite amount of hot water sitting in a tank that will cool off by the time you take your morning shower. Space efficient: This is excellent for homes that do not have a lot of space to spare. Tankless systems can be mounted on walls, leaving more floor space for furniture or storage. Energy savings: Tankless water heaters use 40% less energy to heat the same amount of water compared to a traditional system. This significantly reduces your hot water costs. Cleaner water: Since tankless water heaters do not feature a tank to store water, they provide cleaner water than traditional systems. Traditional water heater tanks degrade over time, so the water they supply may contain rust and other contaminants. Eco-friendly: Tankless water heaters are often made out of recycled material; this means less waste was created as a result of its production. Traditional water heaters produce more waste that will be transported to a landfill. How long do tankless units last? A tankless water heater is expected to last up to 20 years. Most traditional water heaters will start to break down around the 10-year mark, becoming much less efficient and failing to heat water as quickly as before. Even though tankless water heaters seem like the ideal way to save on energy and hot water costs, it is not the right system for every household. Your hot water needs may differ from that of your neighbor depending on the size of your family and how much hot water you use on a daily basis. Contact us to see if installing one is right for you. By having our professionals assess your home’s hot water needs, we will be able to properly size your new tankless water heater to meet your hot water demands. How much energy can you really save by installing a tankless water heater? Call us today at (410) 268-7191 to find out. We will evaluate your home’s hot water needs to help you choose the ideal water heater.